A World War II 50 caliber practice / dummie shell used to train soldiers how to handle ammunition and load guns, usually a 50 cal. machine gun. It never contained gun powder. The camouflage pattern was taken from WWII patterns used by the Marines in the South Pacific. Basswood strips, steel wire, copper sheet, acrylic paint. 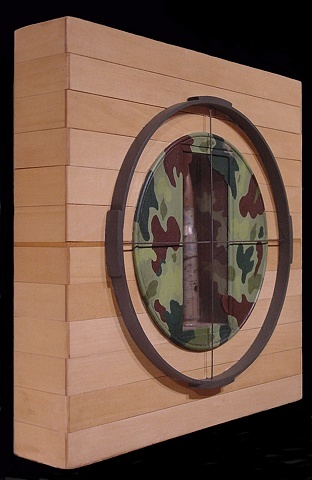 When I worked on this piece I thought of who might have saved a bullet and ultimately enshrined it. I thought about a recruit bringing it home from boot camp or a little brother making it a project in a woodshop class as a memory of his brother. 12 3/16" sq. x 3" d.